Lipno Lake Resort, in cooperation with the Ski resort Lipno, prepared an exclusive offer for you at the occasion of opening and closing skiing season in Ski resort Lipno. You can gain six-days ski passes for all people from your apartment only for the handling charge 100,- CZK per ski pass to every one-week stay in the below mentioned December and March dates! So you live in comfortable apartments Lipno Lake Resort directly at the cableway of Ski resort Lipno and you are skiing gratis. We have found inspiration in Livigno, Italy and we bring such offer to the Czech Republic for you. We hope you will be delighted by it. 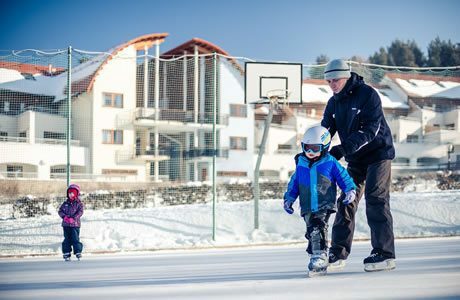 A winter holiday in Lipno with accommodation in the luxurious apartments of Lipno Lake Resort and skiing at ski resorts Lipno, Hochficht or Sternstein combines varied skiing in Czech or Austrian resorts with comfortable family accommodation in Lipno nad Vltavou. 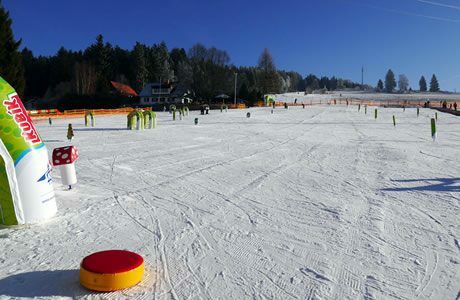 A stay in apartments directly at the ski slopes of the family orientated ski resort Lipno with the possibility of skiing trips to the nearby Austrian ski resort Hochficht or Sternstein is a guarantee for an exciting skiing experience for beginners as well as experienced skiers. 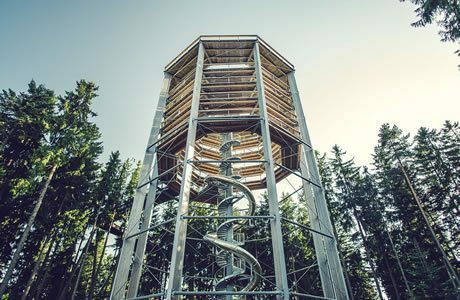 Lipno Lake Resort has been specializing and concentrating on providing the best quality holiday accommodation for families with children and has been in past years rated as a top provider in quality in the Lipno area on various European consumer servers. Services and exclusive offers provided grow each year in variety and quality. One of the most beneficial bonuses is the resort´s location – right next to the ski slopes and the ski lift. The resort is proud to have many loyal guests who return every winter. 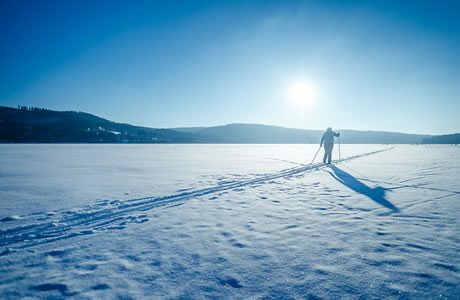 Lipno has become in the family paradise of all your winter fun in the past few years. 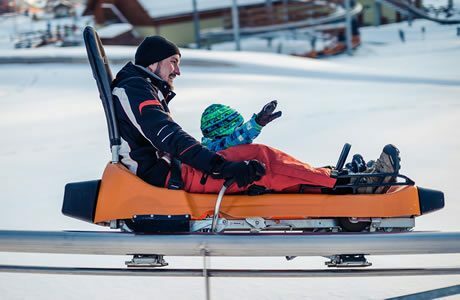 Apart from skiing in the Lipno Ski Resort, you can also enjoy a trip to nearby Austrian resorts of Hochficht and Sternstein or to neighbouring Skipark Frymburk. 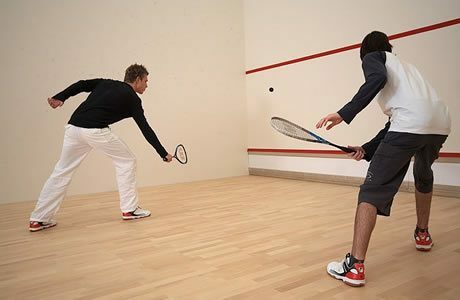 Your winter holiday in Lipno Lake Resort is not just about down-hill skiing. You will find well-serviced cross-country skiing trails not far from your apartments. 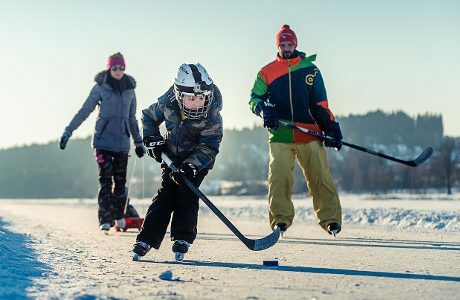 Our resort offers lit ice-skating rink, sledging slope in the nearby children´s playground of Fox the mascot or serviced ice-skating highway on the frozen Lipno lake. 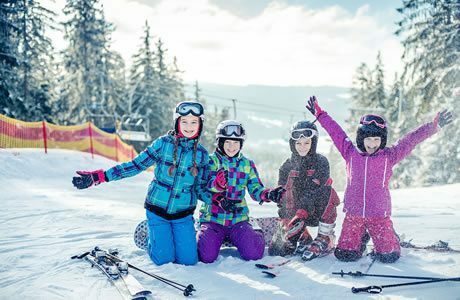 There is a modern, fully equipped winter sports equipment rental right next to our reception, so you do not have to worry about searching for skis, ski boots or ice-skates for your kids, who will grow out of them in a year or two anyway. Our rental shop offers quality and regularly serviced carving skis, snowboards, cross-country skis, sledges, fat bikes or ice kick-scooters from renowned brands, including all necessary accessories. All this at favourable discounted prices for our guests. Not only do we at Lipno Lake Resort think of your comfort, we also consider your family budget. We have secured unlimited free entry to aquapark Lipno for our guests and therefore allowing them to enjoy pleasant relaxation after a day´s skiing. The price of stay also includes the use of the ice-skating rink and children´s corner. Online ski equipment rental, ski-school and ski pass reservations – comfortably, in advance and with a discount! Easy online reservation of skiing or snowboarding equipment with 15% discount. Open reservation form here. 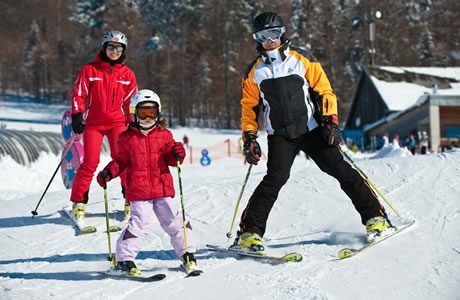 Easy online ski-school reservation in the Lipno Ski Resort with 15% discount. Open ski-school reservation form here. When you book a stay in the Lipno Lake Resort you will, along with your confirmation, automatically receive your log-in information into the resort´s mobile phone application Lipno Lake Resort – GrenzgeinalGuide, which provides dozens of coupons for attractive discounts of up to 50% for various services and close-by attractions. 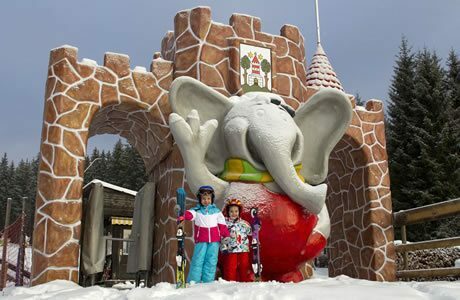 Lipno Lake Resort welcomes and likes to pamper families with children and is therefore a favourite resort for many. We recommend booking well in advance. Book your Lipno holiday in time and enjoy the “early booking” discount of 7=6 days, meaning one day of your stay is free. Would you like to know more about accommodation in Lipno Lake Resort? Do not hesitate to write or call.